Tire Totes take the hassle out of changing, transporting and storing your race tires. Tire Totes slip over your tires providing an easy-to-carry bag with handle that protects you, your vehicle and garage from tire grime. Tire totes are machine washable and will accommodate any tire from 21 to 31 inches in diameter. They are made from a rugged, ballistic nylon to provide years of trouble-free use. 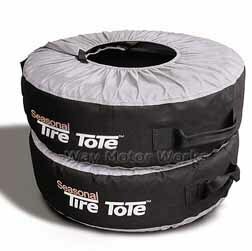 Two Tire Totes: $19.95. *Buy more and save! Four Tire Totes for $34.95.